A flight from Leipzig to Sharm el Sheik usually costs € 450-500, but with early booking discounts or special offers, which once in a while are available for example under the name »Condorfliegen«, it might turn out even cheaper than that. Please note that Christmas and Easter are popular times for travelling, and the prices will reflect this fact. In Dahab there is a lot of simple accommodation available (hostels from 10 € per night / per person), just as normal hotels including breakfast (about € 15-30 € per person), but you can also find more exclusive accommodation. Numerous deals in each category can be found on the Internet (eg hostelworld and enter »Dahab«). The hotel accomodation I have recommended and booked for participants until now, have always been to their complete satisfaction. For entering the country a valid passport is needed, with at least 6 months’ validity left. An identity card and an extra passport photo would also be sufficient. If you enter the country with an ID card only, then a so-called yellow card needs to be filled out, which you will get at the airport on request. It needs to be filled out right there and two additional passport photos are needed. A visa can be paid for at the airport upon arrival (approx. U.S. $15) Please do check/verify your nationality´s specific visa requirements before travelling! To me personally, having a visa has always felt reassuring, as there are many police road blocks, which since the terrorist attacks several years ago are part of everyday life in Egypt. It is not mandatory however, a stamp in your passport should do! ->Please do check/verify your nationality´s specific visa/immigration requirements before travelling! Currency exchange at local banks with their long opening hours (plus ATMs) is much cheaper than buying egyptian currency in Germany. Dahab has plenty of ATMs, which can do cash exchange as well. Please make sure that your tetanus vaccination is current. It must be renewed every 10 years. There are no compulsory vaccinations. It is your personal choice/responsibility to get vaccinated. I also recommend a diphtheria vaccination as well as anti diarrheal medicine. Please make sure your vaccinations are taken care of on time (not right before the trip), Depending on the vaccine, it might take some time till actual protection kicks in. There are pharmacies in Dahab which have a wide selection of medicines available. In Dahab there are two hospitals, one of them to European standards, as well as a good dental clinic. The cost of treatment and medicines are to be paid locally and are, compared to Germany, rather inexpensive. Should there be an emergency while we are camel trekking, the Bedouins´ relatives will be informed by mobile phone. Every family owns an off-road car, which will then come to our rescue. Adapters (for German plugs) are usually not required, but if you you need adapters, they can be purchased locally (like everything else as to daily essentials). London Time is the same as Greenwich Mean Time less than half of the year. During Daylight Saving Time, London Time is GMT+1, also known as British Summer Time (BST). Egypt Standard Time is 2 hours ahead of Greenwich Mean Time (GMT+2). Egypt operates Daylight-Saving Time between the last Friday in April and the last Thursday in September when the clocks are 3 hours ahead of Greenwich Mean Time (GMT+3). Weight allowance -> the weight of the luggage should be limited during the safari, as the camels do carry everything for us, our food as well as the animal feed, water, blankets, our luggage and us. Important is a closed backpack or a bag which can be securely mounted on the camel´s saddle and can be packed easily and quickly. I recommend the »onion principle«, that is several layers of clothing. lightweight hiking shoes (not sandals!) that are comfortable for walking, but are not too heavy for riding on a camel. comfortable old jeans suitable for riding or riding breeches for horse back riding. During spring and autumn it can become quite warm during the day, but I stilll would recommend long-sleeved clothing for sun protection. I will bring disinfectant, a first aid kit, anti-diarrheal and circulation stabilizing medicines. You will be provided with a list of the content of our medical kit. 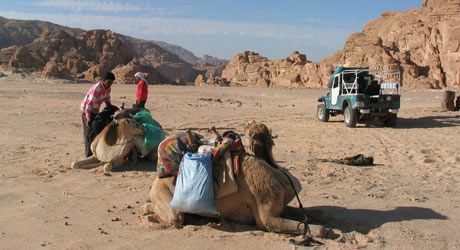 The safari takes 7 days and 6 nights; in the evening of the last night you will be dropped off to your Hotel in Dahab. Please make a request for additional information. giving up the food stuff that you would normally prefer (nuts, sweets or dates are recommended as snacks for the trip and can be purchased inexpensively in Dahab). So far, all participants loved the fresh food prepared over an open fire – the Bedouins do a great job with their culinary skills! This tour is all about adventure, letting go and entrusting yourself to nature in all its authenticity in order to be able to relax, explore and enjoy. We are traveling in a group, which requires a down-to-earth understanding of what a group is and a willingness to lend a helping hand to your fellow group member. This is all about being together and doing things together. However, it will always be possible to withdraw a bit. Travelling in the fresh outdoors implies that everyone will retain a sense of being a separate person in their own right, even though being part of a group. If the participants are open to this, we can do meditation together in the evenings. The magnificent landscape, watching the Bedouins who will be leading and helping us, the camels, the absolute silence, the lovely night sky, which offers a clear view into our solar system as it can only be found in deserts, all this will have a relaxing, meditative influence on you. In my experience, this gift which you will receive for all the »hardships« experienced during the tour will be with you for a long time and can be a beacon to you in your everyday life. I will do my best, to offer a variety of wonderful things to see, of »moving forward«, of breaks and pleasant togetherness within the group, as with the Bedouins and the animals. I’m looking forward to this safari together with you.